Persephone Books is one of my absolute favorite bookshops. Not only have I never been disappointed in a book I have bought from them but also, their books are gorgeous with their uniform grey covers and beautiful endpapers. 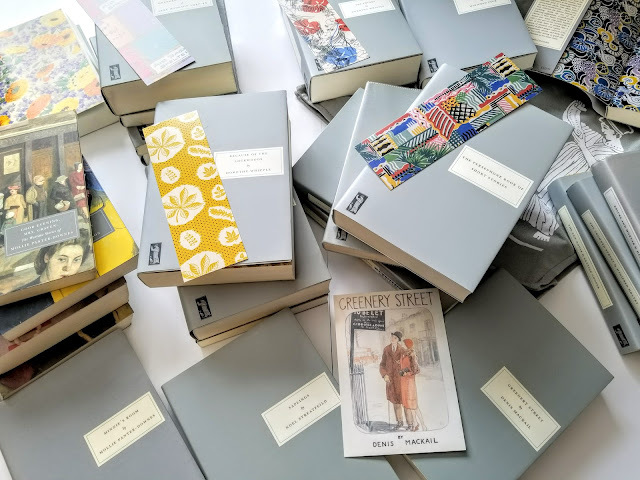 Persephone Books reprints neglected (mostly) women authors, authors such as Dorothy Whipple, Monica Dickens, and Mollie Panter-Downes. The first Persephone book I ever read was Greenery Street by Denis Mackail. (Interesting side point, he is the brother of Angela Thirkell.) It is the charming story of a newly-wed couple who are setting up housekeeping. Just look at the postcard that came with the book. 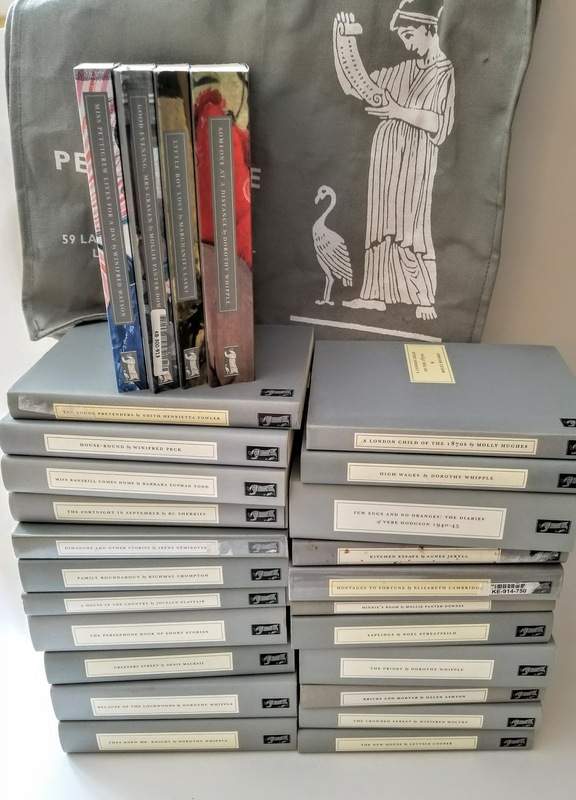 Since that first book I have purchased twenty-six more Persephone books. The photos below are missing one book because I found it stuffed into a bookshelf after I was all done and honestly couldn't be bothered to redo the photos. So, imagine there is also a copy of the biography of the writer, Elizabeth Taylor, in this stack. I think I have about six that I haven't read yet and several that I would love to reread. Of course, there are also many more that I would love to buy. There are always books I would love to buy. Are you a Persephone Book addict as well? What are your favorites? I absolutely must visit this bookstore one day! It is a gorgeous shop with gorgeous books. I hope you get there one day. I love these photos, Jennifer!! Looks like we have at least a few Persephone books in common. Do you know which one you're going to pick up next? Also, I'm very jealous of your tote bag! I think The Priory but that could change! I love the tote bag so much I am almost afraid to use it because it will get dirty. But that is just plain silly. I love your photos and I'm envious of your collection, which is bigger than mine. I hope I'm able to visit the Persephone bookshop one day. I hope you get there too. It is such a lovely shop. I have The Home Maker and Saplings ... and I've read some of the books they've published (like The Making of a Marchioness, Miss Buncle's Book and Diary of a Provincial Lady) but in other editions. It's hard to pick a favorite, they are all quite different but lovely! I have read quite a few of the books they publish but in other editions. I think that is what first made me pay attention to them. We're currently in the middle of a move and I had to read the part of your post about getting rid of furniture to make more room for books to my husband. I just wanted to prove to him that I'm not the only person who thinks like that! I can see how they would not appeal to everyone but I love the quiet, character-driven books they publish. And Miss Pettigrew is just fantastic! Oh, you should! That is a blog post I would love to read. I've just finished reading The Exiles Return by Elisabeth de Waal - it's very good. I don't know if I could trust myself to go to the Persephone shop, it would be very painful for the bank balance. I haven't read that. 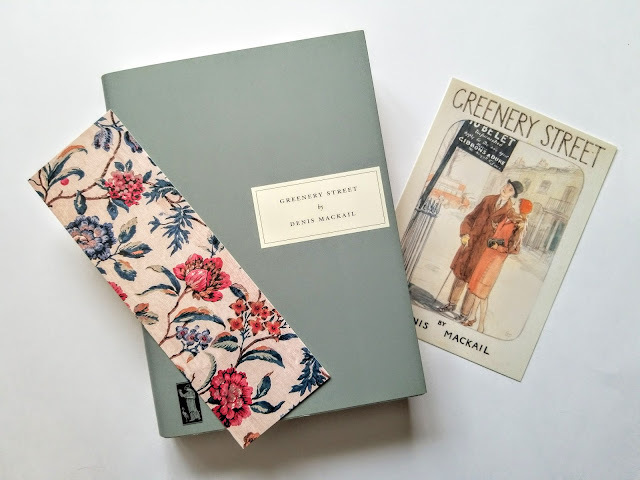 I will have to add it to my list of Persephone books to buy one day. The only reason my trips to the Persephone shop are not too painful is because I am very aware that I have to fit all my purchases into a suitcase. Otherwise, there is no telling what I might do!